Housing Hero was created by Bethlehem Housing and Support Services in collaboration with community members concerned about the growing issue of homelessness in Niagara. What started as a grassroots initiative has grown to provide housing and supports for over 300 families each year. More than 5,000 families will wait 5 years on a list for subsidized housing, paying unaffordable rent, where there is no vacancy. Visit the Housing Hero website to learn more about the housing crisis in Niagara. 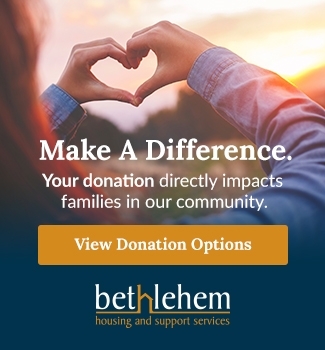 Become a Housing Hero by Volunteering with Bethlehem. Housing Hero is looking for individuals and businesses to share their time, talent or treasure. Listed below are some of the ways in which you can volunteer with Housing Hero. If you have a unique idea of your own, we'd love to discuss it with you. Our youngest Housing Hero had her family and friends donate to Bethlehem instead of receiving gifts for her 8th birthday party. Creative Director at CMSIntelligence volunteered his creativity and graphic design skills to help build our new Housing Hero website. The Barry Team at Revel Reality orangized and hosted a Do-It-Yourself Fundraiser with all proceeds donated to Bethlehem. 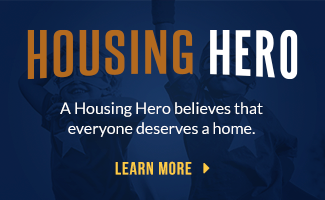 Graphic designers at Brand BLVD generously contributed their incredible design talents to create our Housing Hero logo. Along with volunteering at Empty Bowls, Victoria connected us to individuals and businesses in the community for prize donations and sponsorship. We are always open to new ideas and would love to hear from you! Use our form to let us know how you would like to be involved. Complete the form below to volunteer with Housing Hero.